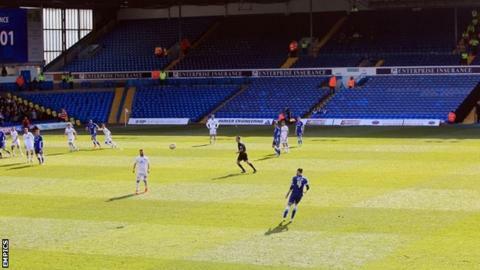 Cardiff City beat Leeds United but their goals were met by silence after Bluebirds fans boycotted the game. The Welsh club were angry with their "derisory" 500-ticket allocation so sent all of the tickets back. The game had little riding on it with both sides in mid-table and Sean Morrison opened the scoring for the visitors from close range. Kalvin Phillips scored on his home debut for Leeds but Aron Gunnarsson got the winner after a scramble in the box. Cardiff are now 12th, and Leeds 15th, with neither side being in either the promotion race or relegation-threatened places. When defender Morrison forced the ball home, there was nobody to celebrate his strike aside from his Cardiff team-mates and coaching staff. Phillips, 19, scored his first senior goal - on his second appearance - three minutes later when keeper David Marshall slipped as he came off his line and the young player sent Charlie Taylor's cross into an empty net. It was met with the ironic chant of "you're not singing anymore" from the home fans. Cardiff lost Conor McAleny to injury and replaced him with Eoin Doyle, who was twice denied by keeper Marco Silvestri. But they got their winner when Silvestri parried an effort to Gunnarsson to score. Leeds brought on strikers Billy Sharp and Steve Morison, who both had chances to equalise. Sharp headed against the bar moments later and Morison headed into the crowd. "That was a poor performance. At half-time they needed a rocket from me and they got one. It is nothing personal, but it is important that they understand when I am not happy. "The thing that was missing more than anything was a desire and the effort needed to get us back in the game. It was a strange performance from us because all the things we stood for during the run that got us out of trouble were missing today. "They were two poor sides, to be honest, in a game that was strewn with bad decisions and mistakes. I was more unhappy with the senior players than anything. The kids give you effort and endeavour." "Our away form has been pleasing and if we can match that in our remaining home games it would be a good end to the season. "It was unfortunate that we had no supporters at the game. That's a first for me - usually there are at least two men and a dog. "I was disappointed for our fans because they would have witnessed a really strong, aggressive performance and a good three points." Match ends, Leeds United 1, Cardiff City 2. Second Half ends, Leeds United 1, Cardiff City 2. Corner, Cardiff City. Conceded by Giuseppe Bellusci. Stuart O'Keefe (Cardiff City) wins a free kick on the right wing. Attempt missed. Stuart O'Keefe (Cardiff City) right footed shot from outside the box misses to the right. Assisted by Bruno Ecuele Manga. Offside, Cardiff City. Lee Peltier tries a through ball, but Eoin Doyle is caught offside. Substitution, Leeds United. Souleymane Doukara replaces Gaetano Berardi because of an injury. Kadeem Harris (Cardiff City) is shown the yellow card for a bad foul. Attempt missed. Aron Gunnarsson (Cardiff City) right footed shot from the right side of the six yard box misses to the right. Assisted by Peter Whittingham with a cross following a set piece situation. Alex Mowatt (Leeds United) is shown the yellow card for a bad foul. Eoin Doyle (Cardiff City) wins a free kick on the right wing. Corner, Leeds United. Conceded by Kadeem Harris. Attempt saved. Gaetano Berardi (Leeds United) right footed shot from outside the box is saved in the bottom left corner. Assisted by Alex Mowatt. Substitution, Cardiff City. Stuart O'Keefe replaces Craig Noone. Attempt missed. Kadeem Harris (Cardiff City) right footed shot from the centre of the box misses to the left. Assisted by Craig Noone with a cross. Attempt blocked. Craig Noone (Cardiff City) left footed shot from the right side of the box is blocked. Assisted by Eoin Doyle. Offside, Cardiff City. Craig Noone tries a through ball, but Eoin Doyle is caught offside. Substitution, Cardiff City. Kadeem Harris replaces Joe Mason. Billy Sharp (Leeds United) hits the bar with a header from the centre of the box. Assisted by Charlie Taylor with a cross. Substitution, Leeds United. Steve Morison replaces Kalvin Phillips. Substitution, Leeds United. Billy Sharp replaces Mirco Antenucci. Goal! Leeds United 1, Cardiff City 2. Aron Gunnarsson (Cardiff City) right footed shot from very close range to the centre of the goal following a corner. Attempt saved. Sean Morrison (Cardiff City) right footed shot from the centre of the box is saved in the centre of the goal. Assisted by Lee Peltier with a headed pass. Corner, Cardiff City. Conceded by Marco Silvestri. Attempt saved. Joe Mason (Cardiff City) right footed shot from a difficult angle on the right is saved in the centre of the goal. Corner, Cardiff City. Conceded by Charlie Taylor. Corner, Cardiff City. Conceded by Scott Wootton.